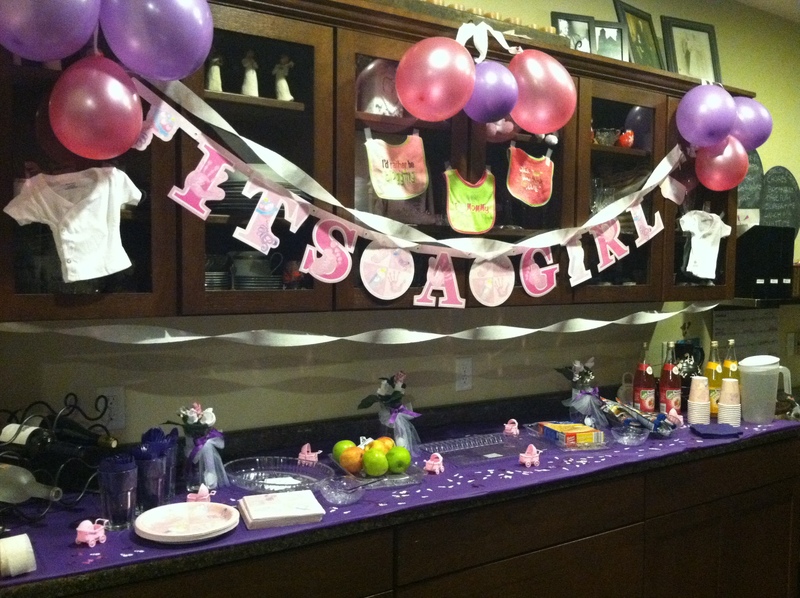 Baby Showers & Bridal Showers & Budgets-Oh My! I don’t claim to be ‘Suzy-Homemaker’ but I am pretty sure my undergrad Family Consumer Science degree gives me a little ‘kitchen credibility’ so when called upon to throw a shower I had no trouble stepping forward to give it the ol’ college try. As with most things, I learn as I go and this is no exception. The mother-to-be’s favorite meal of the day is breakfast so we went with a baby shower brunch. The menu included virgin mimosas, banana bread, blueberry muffins, cinnamon rolls, fruit and an egg bake. All items were pretty inexpensive and fairly easy to complete in advance to make the morning less stressful. Starting to put it all together…. 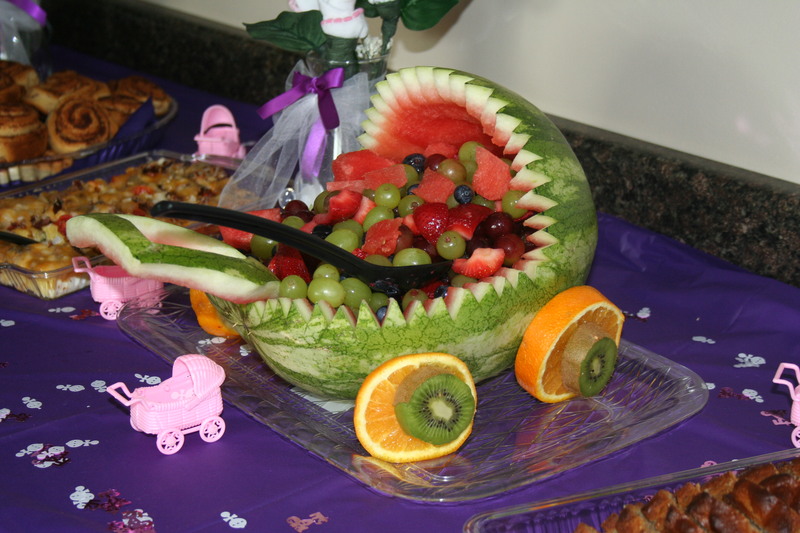 I am never too shy to try something new so after seeing a picture of a cute baby carriage filled with fruit I was convinced I should make one. After I watched a youtube video I was ready. It’s not too difficult but does yield a ton of watermelon. It doesn’t have to be perfect to be cute as you can see. Mine was certainly far from it but still looked great for the occasion. I hit up the dollar store for the banner and paper goods and ended up finding some really nice trays so I picked them up as well. At the time I thought I’d only use them for the shower but I’ve used them over and over because they look nice and you aren’t out your favorite Mikasa serving plate if it never gets returned. I also picked up some baby items from Target for added decor that could be useful to the mother-to-be. many diapers it takes to make one although there are a variety of ways to assemble them. Whether rolling the diapers or spiraling them it’s so many diapers. I suggest filling the inside with other useful items. I know some cakes are made with a champagne bottle in the middle (or sparking cider). 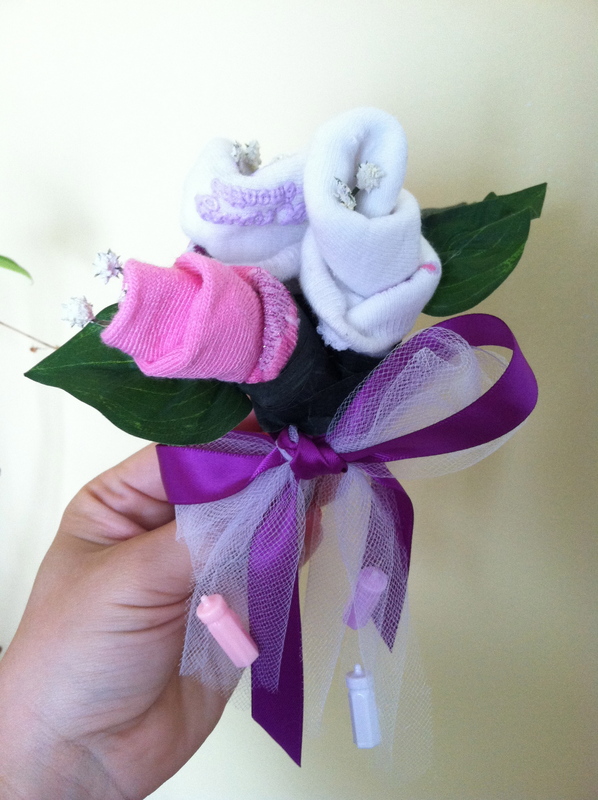 I used baby soap, baby lotion, onesie’s and other baby care items. I found some cute tiny baby items from the dollar store that were intended to be sprinkled on a table for decoration as well as some pretty ribbon. 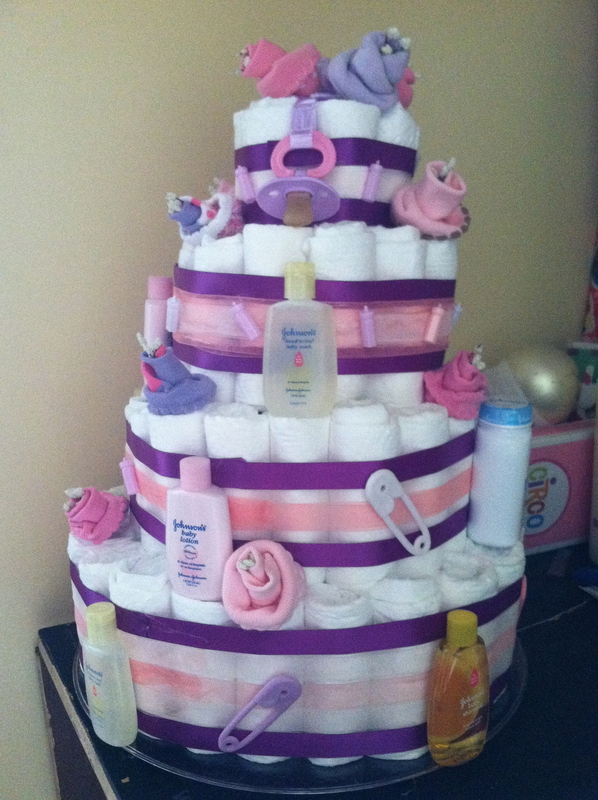 Those tiny items and some travel sized baby items were easy to glue to the cake. Again, time consuming and the inexpensive pieces add up very quickly. 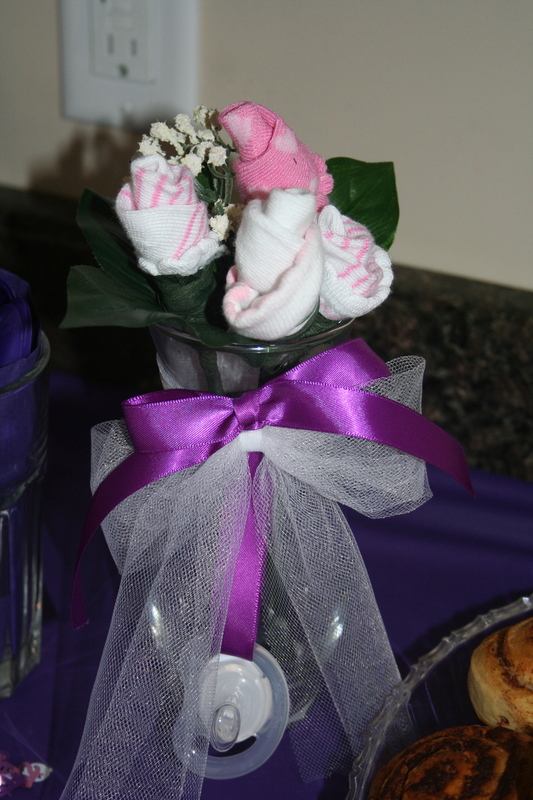 I guess I learned a few things from throwing the baby shower because I felt like the bridal shower went together very easily. The bride wanted a lighter menu so I thought a ‘salad’ bar might be best. 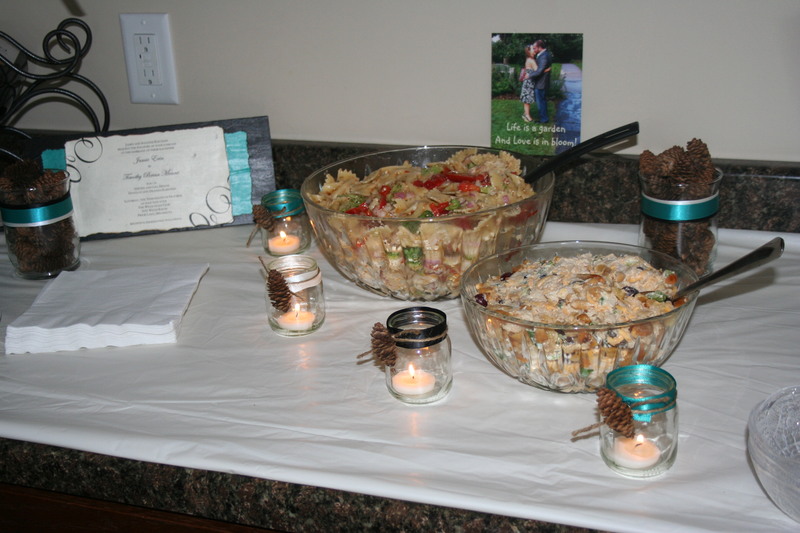 Not the salad bar you are used to with leafy greens but an assortment of salads. That was it would meet the tastes of the pickiest of eaters. I wanted a light drink as well so I went with ice water with lemons in it and a punch that had the same color as the wedding colors, (thank goodness for Kool-Aid). I was already helping with some of the wedding decor so I had some left over ribbon (Yup-from the dollar store) and some twine from Hobby Lobby. I had some clear candle holders (dollar store) and in my craft bin at home I had a plethura of glass baby jars. I found some very pretty serving platters that looked silver but were actually plastic that I liked as well, (dollar store). I found a clear pitcher at Target that I thought would be perfect and I’ve been using it for all kinds of occasions since then. 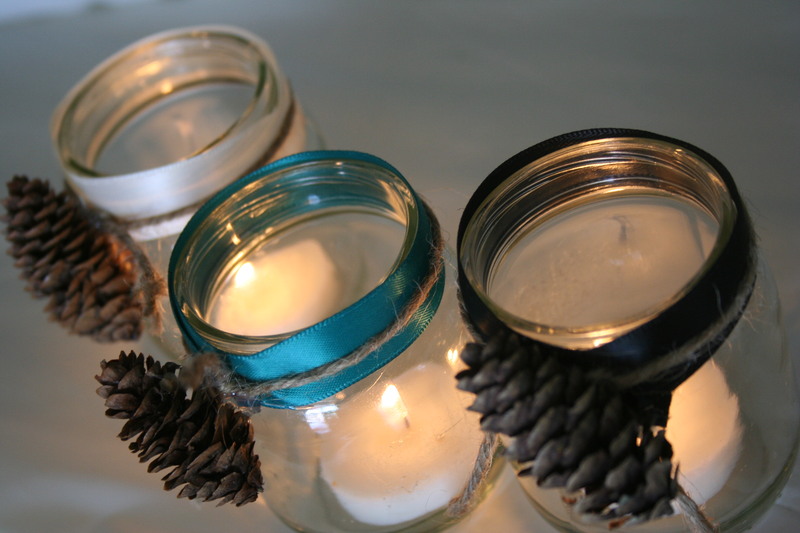 I used the babyfood jars as candles with ribbons and some pine cones from the yard. 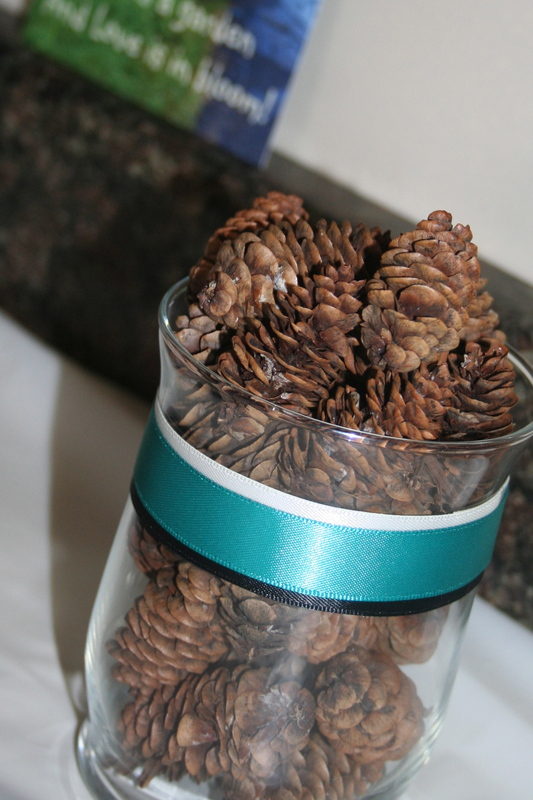 I filled the larger candle holders with pine cones and wrapped them with ribbons. 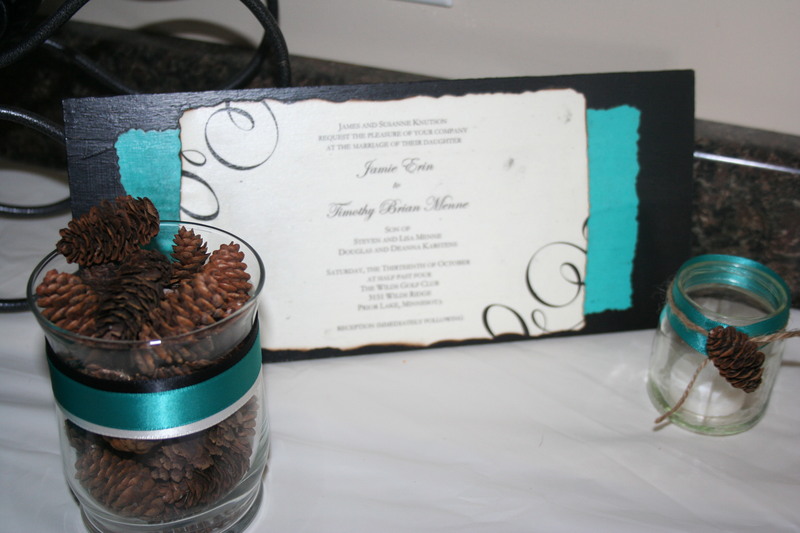 I decided to use the wedding invitation as decoration as well so after burning the edges to give it a rustic look I used spray glue to adhere it to a piece of wood. It turned out okay but not as nice as I had hoped. The spray glue was far too oily and soaked up too much of the paper invitation. 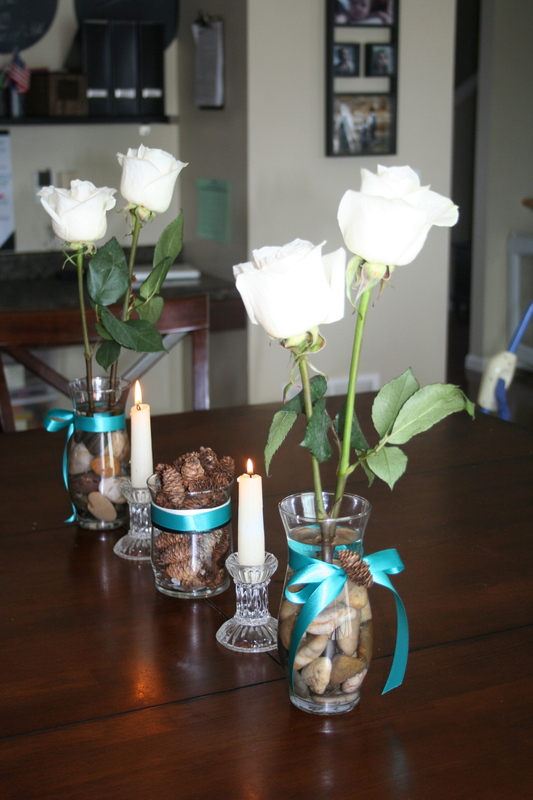 I purchased some fresh roses from the store for the table to contrast the rustic feel. I filled the base of the vases with rocks (both the rocks and vases were from the dollar store). I also found a small log to carve their initials in for what I thought would be a center piece but it ended up being much larger than I thought it would be. 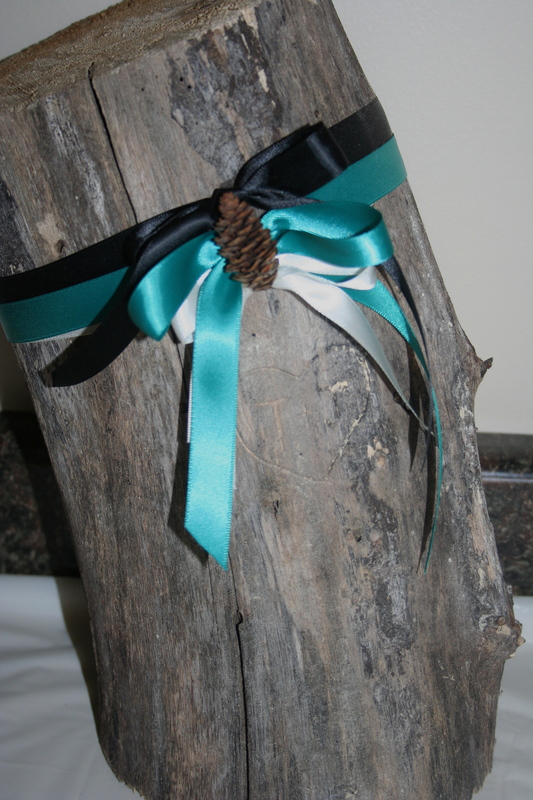 I used it anyway and ended up giving it to the bride and groom with many of the other pieces of decoration. I didn’t score many points on the practical scale with the shower but I liked the overall look of it. I was really trying to please the bride and groom with this one so I spent too many hours on this to admit in writing. The food came together pretty easily as I provided a few dishes and then asked some family members to bring some as well. I really wanted to make these cute little ‘mini-wedding-cakes’ I saw on pinterst, (Darn you pintrest!!!) but I wasn’t able to get them as cute as the pictures. They looked okay but the taste totally made up for their lackluster look. They were the melt-in-your-mouth yummy roll out cookies. I could have eaten the whole tray! I also made some cup cakes but that was more for the little ones at the shower. 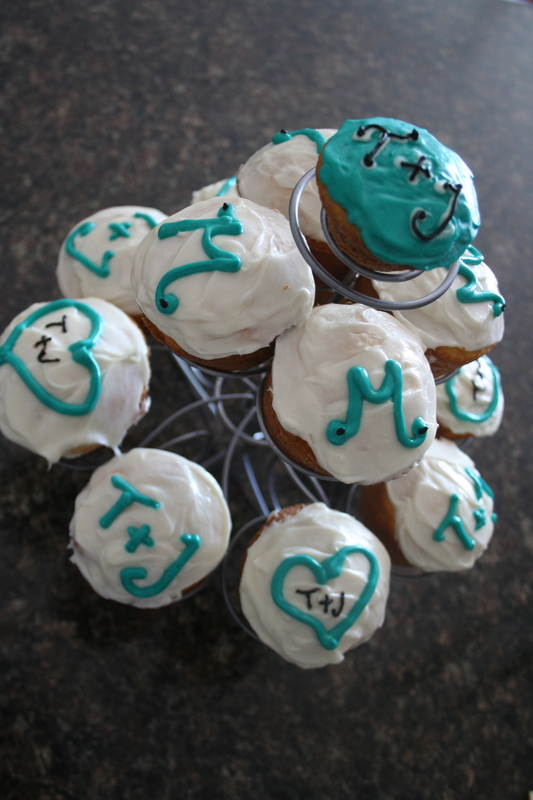 I had fun decorating them as well but again, not the prettiest cupcakes. The winner had to be the angel food cake. 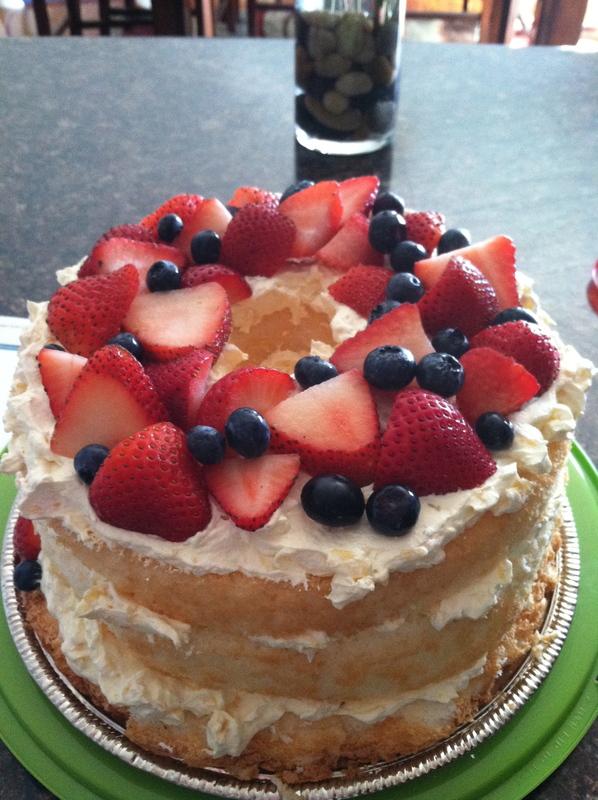 I can’t recall where I found the recipe but it had layers of lemon flavored cream with fresh fruit on top. It was sooo delicious!! I decided NOT to DIY the invitations but instead made them using an online company that allows for personalization of the invitations. I decided to send out a ‘save the date’ card for the shower in advance which was a DIY so I opted to save some time and just order the actual invites. ideas on the web. (I looked through many other bridal blogs, party planning blogs and such before getting started.) Another key tip, divide and conquer. I am a control freak so I have a tough time pulling off such an event with others but if you can handle assigning a task or two to family or friends-do it. We all want to be superwoman but even she needs help sometimes. As far as the budget, keep all of your receipts and tally them up. Even the dollar items add up quickly. Good luck with your shower.